UNITED NATIONS, September 3 -- Video depicting UN peacekeepers committing sexual abuse in Haiti has surfaced, two weeks after the UN asked Inner City Press' August 17 questions about the abuse by saying on August 18 that its "investigation was finalized... these allegations were unfounded." The UN never retracted this denial, or whitewash, even as the cell phone video Inner City Press asked about became public. This classic UN cover-up comes at a time when UN Secretary General Ban Ki-moon has just named as the new head of UN Peacekeeping a French bureaucrat, Herve Ladsous, who was a public face of France's call in 2004 for Haiti president Jean-Bertrand Aristide to leave the post to which he was elected. One would expect Ladsous to be questioned about this, to face some form of confirmation process. But thus far, the UN has been unwilling to even describe the process by which Ban Ki-moon chose Ladsous. Inner City Press: in Port-Salut there are complaints against the Uruguayan peacekeepers of MINUSTAH [United Nations Stabilization Mission in Haiti], including on sexual abuse grounds --what is MINUSTAH’s response on this topic that Ban Ki-moon has recently said is so important to him? Acting Deputy Spokesperson Haq: MINUSTAH is in fact looking into this to see about these allegations and whether there is any credibility to them. "further to what I said yesterday on an investigation in Port-Salut, Haiti, the UN Mission there (MINUSTAH) tells us that the preliminary report of this investigation was finalized. After discussions with local authorities and members of the population in Port-Salut, the investigators found out that these allegations of misconduct could not be substantiated. The UN Mission in Haiti says that no supporting evidence was provided by anyone, and local authorities confirmed that these allegations were unfounded." Inner City Press: ... took photos on their cell phone. When you say it has been disproved, did the UN check the cell phones, or are you saying simply that the NGO and local authorities couldn’t show you the peacekeepers’ cell phones? I mean, what was done to investigate that specific claim? Haq answered that "no supporting evidence was provided by anyone. So, again, there was no supporting evidence on this and the local authorities informed us that the allegations were unfounded." Inner City Press: Was a request for evidence made to the peacekeepers themselves rather than the people whose photographs…? Acting Deputy Spokesperson: They carried out an investigation. It now appears that what the UN carried out was a whitewash, or cover-up. The video is out -- here is a less edited version, that YouTube took off its site -- just as Ban while traveling in Australian and Kiribati has his new Deputy Spokesman announce, but not answer questions about, the naming of France's Herve Ladsous as new chief of the Department of Peacekeeping Operations, which overseas the mission in Haiti, and those in Congo, Sudan and elsewhere. A French foreign ministry spokesman, Hervé Ladsous, said France's proposals for an interim government and an international force to restore order had been discussed. The UN has said it can approve a civilian peace force when the government and the opposition reach agreement on sharing power and ending the fighting. Will Ladsous have to answer for this? Will be belatedly be vetted, even subject to some sort of confirmation process? Watch this site. UNITED NATIONS, September 2, updated -- After leaving the UN's top peacekeeping job vacant for four weeks, Secretary General Ban Ki-moon on Friday as expected named a Frenchman to the post, but not the Frenchman who had been bragging that he had the job, Jerome Bonnafont. Inner City Press had been the first to name Bonnafont, and quoted Indian diplomats to whom Bonnafont bragged he had the job. Even in front of the Security Council on Friday morning, the departing spokesman for the French Mission to the UN was unaware of dark horse candidate Ladsous. So were others in the French political world. On August 20, Inner City Press published a card of congratulation directed to Bonnafont at the UN in New York from French Senator Jean-Marie Bockel. But at Friday's noon briefing, the name read out was Herve Ladsous. Inner City Press asked Ban's new deputy spokesman Eduardo del Buey to describe the selection process, and whether any of the finalists had not been French. His answer was general, that all UN selections like the one through which he got his job are transparent. But the top peacekeeping job, and most Under Secretary General jobs, are different. Kofi Annan "gave" DPKO to France as part of being Secretary General. From Jean-Marie Guehenno the post went to Alain Le Roy and now to the third Frenchman in a row. Owning UN Peacekeeping is useful to France: just this week in Paris, Nicolas Sarkozy bragged of his country's military action in Cote d'Ivoire as well as Libya. As reflected in documents exclusively obtained and published by Inner City Press, France has no problem using DPKO to advance its economic interests, click here for examples. Who is Herve Ladsous? He was French ambassador to Indonesia, then a spokesman and diplomat in Paris, then Ambassador to China. He appears in a 2006 Wikileaks cable about Sri Lanka, telling the US that he is angling to get appointed to an Ambassadorship in India -- where Bonnafont went -- or China. He does not appear to have any military experience. Tellingly, he was France's "deputy ambassador to the United Nations in New York." We'll have more on this. 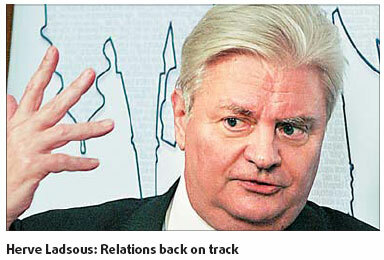 "French MFA A/S equivalent for Asia, Herve Ladsous. Ladsous said that the GoF had no objections in principle to forming the two working groups, though, he added, France would probably not insert itself into a leadership position. He said that the GoF would support the formation of both working groups and noted that the group charged with examining LTTE financing would be of particular interest to the GoF given France's significant Tamil population... Ladsous mentioned that he was angling to become the next French Ambassador to China or India." And the rest, as they say, is history. We'll have more -- watch this site.